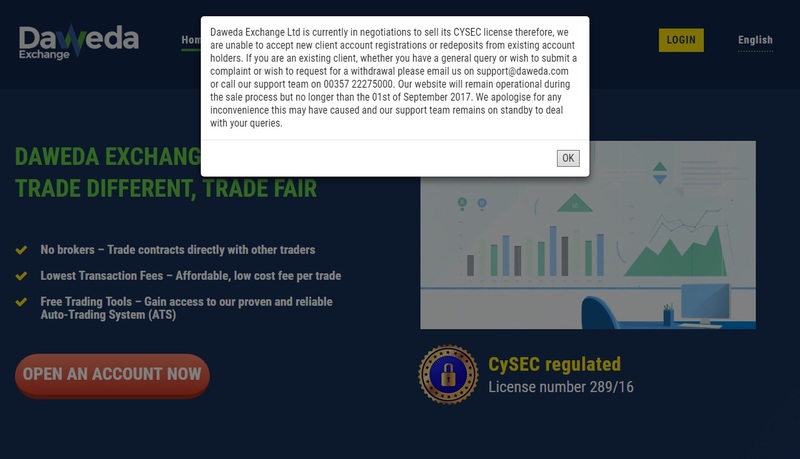 The binary options exchange Daweda announced that it is selling its license, therefore it is no longer regulated. Daweda represents an interesting concept, where there is no broker between binary options trades, trades are executed directly. The exchange just provide the technological platform to match the trades and takes a fee. However in our Daweda review we showed that there are many problem with this particular brand. Daweda is openly lying and we hear a lot of bad reviews about them from real user. Maybe this was among the reasons why Daweda is now selling its license. It is no longer a regulated broker in the EU.